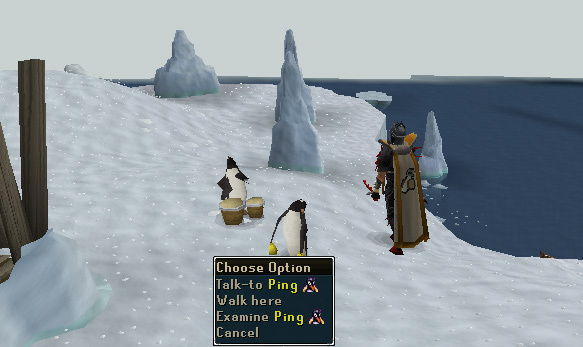 This is the third quest in the penguin series. While trying to find Larry, a PBJ agent named Teddy is missing in action. A ransom note has been sent to Chuck and you will be asked to find out what happened and save the day. Teddy - an agent of the PBJ - has gone missing while on the trail to find Larry. Chuck has received a ransom note from the Walrus and has asked you to investigate. Become a roadie for the famous Ping and Pong and break into a PoW camp to save Larry. 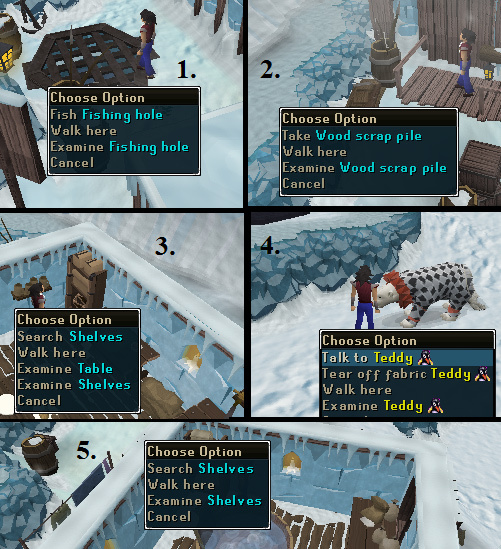 Speak to Chuck the Polar Bear in the Ardougne Zoo. 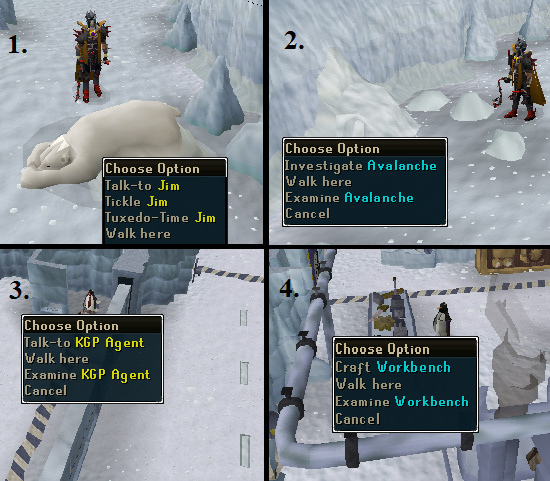 To start the quest, talk to Chuck in the Polar Bear exhibit in Ardougne Zoo. He will tell you that Agent Teddy has become a P.O.W. (Prisoner of Walrus, not Prisoner of War). Your mission will be to infiltrate the P.O.W. camp and rescue Teddy. Chuck will give you the ransom note sent from "The Walrus". After you get the note, talk to Chuck again and he will teleport you to the dock outside the gates of Rellekka to the east. When you arrive, speak with one of the Seals west of the rock crab area on the left side of the dock. They're all asleep. Click on the one with the "Wake up" option to continue. Note: You may be attacked by aggressive rock crabs. They will not do heavy damage but can be distracting while trying to board the boat or speaking with The Seal. The sleepy seal will angrily wake up. Tell him you are looking for a polar bear. He will refuse to tell you anything, yet reveals that the bear is being kept prisoner. The seal doesn't want anything to do with you unless you can entertain him. Ask him how and he will ask you to dance. Do the Jump for Joy or Dance emote and speak with the seal again. He wants you to use a cowbell, like one of this favorite bands (The penguins, Ping and Pong). Ask him where the penguins live and he will tell you that they are where the rest of the penguins are: Penguin Island. Head northeast of the seals to Larry's boat on the dock, which will be used to reach the iceberg. Ping and Pong will be there when you arrive. 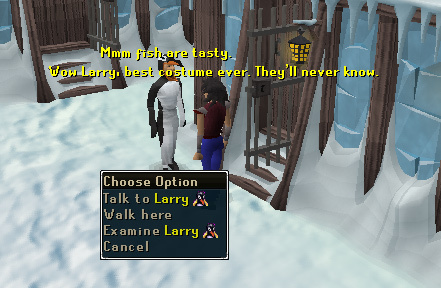 Jagex's humor is present during this dialogue, when they tell you that they knew you were a human the whole time, even with your penguin disguise, and that you should accept yourself for who you are. You will be sent to make a Rock Costume and a Pop Costume in the penguin glacier's War Room. Alternatively, you may use the crafting table in your player-owned house. They will give you the required items, but if you lose them, you will have to replace them yourself. 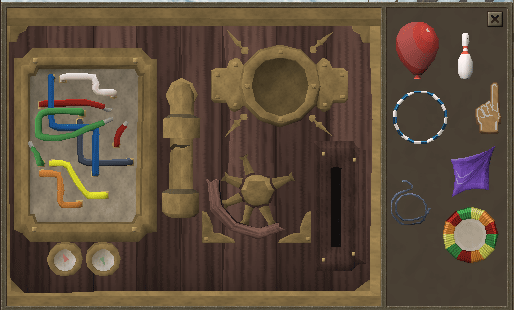 Option 1: Go to the workshop in your player-owned house and click on the Clockmaker's Bench. 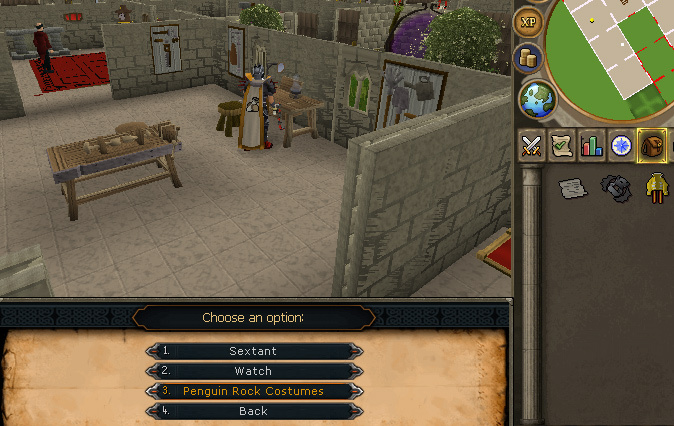 Scroll down to find the option "Penguin Rock Costumes". They will appear in your inventory. Option 2: Go to the northeast corner of the penguin's island and talk to Jim, selecting the "Tuxedo-Time" option for you to get into disguise and infiltrate the base. Go northwest and investigate the avalanche. Follow the hallway north and in the control room you will encounter a gate guard. He doesn't want to be drugged by you again, and will let you pass. The War Room is located in the northeast corner of the cave. Click "Craft" on the workbench and press the red button near the big doors to exit. After you've made the costumes using whatever method you chose, head back to Ping and Pong near the boat. Talk to one of them to give them their costumes and take the boat back to the dock outside of Rellekka where the seals are. Wake up the seal again and a cutscene will start with the seals clapping along to Ping and Pong. The Seal will invite Ping and Pong to perform at their camp, and since you are their "roadie", you have to go as well. 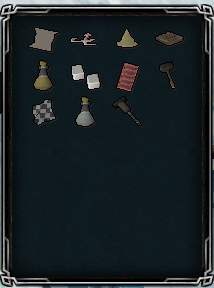 You will be given the option to bank the items in your inventory as well as what you're wearing. You will arrive at the Seal Camp after another cutscene showing The Walrus as a king-like figure about to eat lunch. Go northwest in the town square and speak with Teddy, a bear dressed up like a clown. 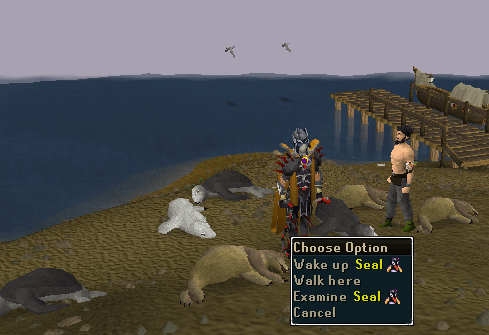 Note: If you log out while at the Seal Camp, you will be returned to the dock outside of Rellekka. Talk to the sleeping seal to return. He will tell you that Larry is also here, and had not escaped. You will then have to speak to Larry in his penguin costume. He is very disoriented and convinced that he is a penguin. Go back to Teddy, the next step is to get Larry an egg. 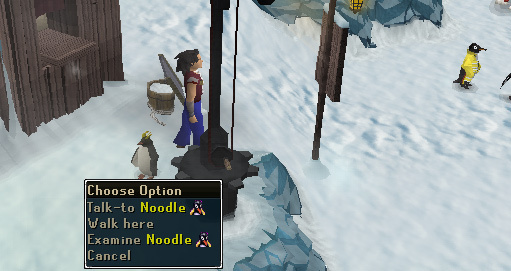 Talk to Noodle, located south near the gate. He will tell you that The Walrus is eating an egg for lunch. Try to enter the building where The Walrus is (The big one to the east of the entrance) and he will initiate a dialogue. Turns out he does have an egg. 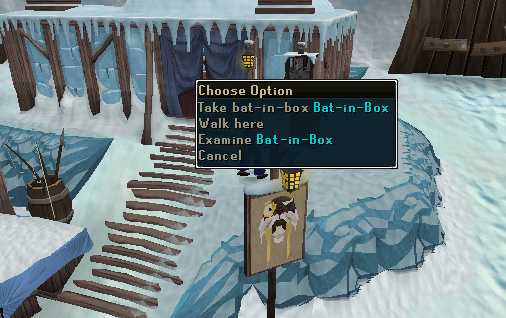 On the right side of The Walrus' tent, click "Take Bat in a Box" to start monitoring sound levels. Speak with Teddy, Bouncer (A seal to the southeast), and Ping & Pong and ask them to make as much noise as possible. Maintain their noise levels by clicking on them to make enough noise to distract The Walrus from his egg. This part can get annoying, but just run around the town square encouraging Ping and Pong, Bouncer, and Teddy to make as much noise as possible. It can go on for several minutes, but just keep their noise status bars blue. The Walrus will eventually get tired of the noise and comes out of his tent to yell at the penguins. When The Walrus walks out, he will begin a dialogue. 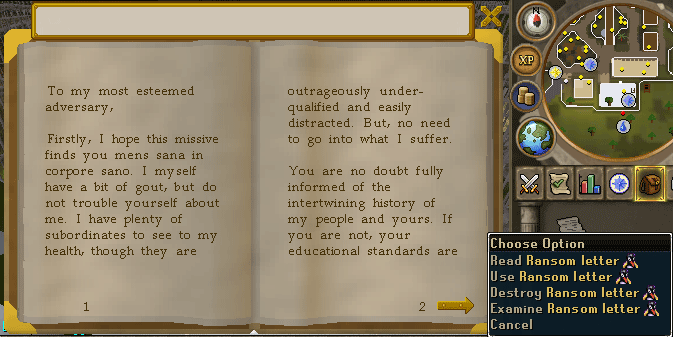 You must click through the dialogue to successfully steal the egg. Your character will tell you when it is safe. Run inside The Walrus' tent and steal the egg from the table, run out, and give it to Larry. You will convince him to leave by telling him that the Seal Camp is no place to raise a child. After all, he thinks the egg is his baby. Talk to Teddy again to find out his escape plan. It turns out that he doesn't have a plan, he didn't plan on getting captured in the first place! You will have to get ideas by talking to the 5 unarmed penguins around the camp. One penguin is behind the house where Larry is located, and the one penguin wearing a military helmet does not count. Report your ridiculous information to Teddy. None of the penguins seem to be of any help, and you will suggest re-building the submarine from Hunt for Red Raktuber. 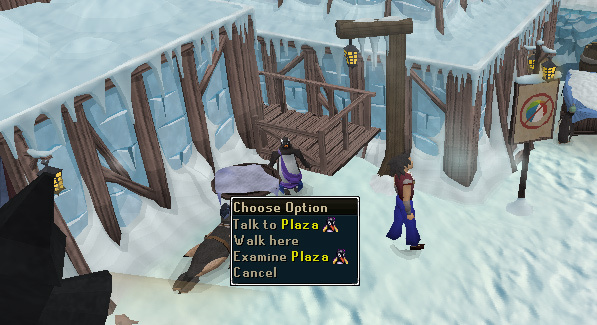 You'll be sent to talk to Plaza, the penguin playing "invisible chess" outside of the kitchen. He is northeast of The Walrus' tent. He will help you, but only if you can create a game of Battlefish for him to play with Astoria. You will receive a list of Battlefish supplies. A Shark Tooth and squid are obtained by fishing in the hole to the northeast of the camp. A board can be found in the wood scrap pile north and behind the kitchen. (The building where Plaza is outside of). Go inside of the kitchen and search the shelves to find a hammer, Popsicle tray, and olive oil. 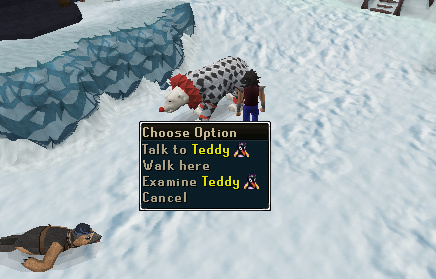 Speak with Teddy, who will give you a checkered piece of cloth from his costume. The southwest house is the laundry house. Search the shelves to get a corkscrew, lye, and there is a chance of getting a hammer from here instead of the kitchen if you don't already have it. Here is a picture of the supplies you should have. Use the Lye on the olive oil and you will make unmoulded soap. Use the soap on the Popsicle tray to obtain the game pieces. Color the pieces by using the squid on the Popsicle tray. Carve the pieces by using the hammer on the soap pieces. Use the checkered cloth on the board to make the game board. Give the completed board to Plaza and Astoria will give you the blueprints for the submarine. When you show the blueprints to Teddy, he will notice that there is a problem with the engine. Ask Astoria to help, and he will. As long as you beat him in a game of Battlefish of course. The game is exactly like Battleship. If you have never played that before, here are the instructions. 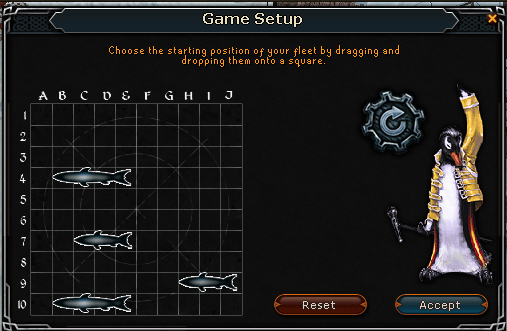 You will place 4 fish pieces onto the game board. You will have to destroy Astoria's 4 fish pieces by trying to map out where they are positioned on his board. The shortest piece takes up 3 spaces, so it would be a good idea to space out your attacks by 2. Click the following spots first, since it is likely you will make a hit: E5, F5, E6, F6. The red X's are hits, and white crosshairs are misses. You will use this information to map out where the enemy's fish are. If you get a hit on E6, click two spaces in any direction until you make another hit. Repeat this until you've won. You may notice that while Astoria's board resets every attempt, his pieces are positioned around the middle. You will almost always get a hit by starting on E5, F5, E6, or F6. When Astoria taunts you by saying "Ha! You missed! ", that is a hint that one of his battlefish is 2 or 3 spaces away. 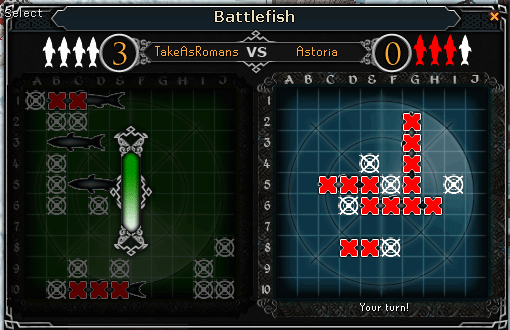 If you lose the game but sink a battlefish in your attempt, the battlefish you hit will be in the same position. It is a good idea to remember that just in case you lose. After you've won, Astoria will agree to unlock the door for you. Go south to the circus supplies storeroom. Search the prop crate and give the supplies to Teddy who will tell you how to fix the submarine. Use the bowling pin on the lever slot on the right. Use the hula hoop on the broken valve wheel. Use the colorful circus plate on the pressure gauge. Use the foam finger on the pressure gauge. Use the purple handkerchief on the broken pipe. Click on the balloon, and then the wire in the circus supplies inventory and you will make an insulated wire, which you will then use on the wire box. The engine is now repaired. Talk to Teddy and a cutscene will play. The Walrus is now on alert. You have to play another game of battlefish. The only difference is that you will assign roles to your crew to maintain the ship. It doesn't matter who gets what job, but if the health bar empties you will die and have to restart by talking to The Seal by Rellekka. Don't worry, it's a safe death (you won't lose any items)! Try to keep your workers assigned to fixing the ship. The bars will decrease about 15 to 20 seconds into the escape. Keep assigning the characters to their roles as they respawn, but wait until most of their stamina bar is blue (otherwise they'll just respawn instantly). You will have to send attacks to the seals by using the periscope in the west room by playing Battlefish. Your first priority should be finding the seals' ships since your health is reset every time you sink one. You also regain your ship's help by repairing it. The seals have 3 ships, and you have 2. Two of the seal ships have 4 spaces, and one of them has 3 spaces. This can be very annoying. One good strategy is to make two or three shots, then check the health status of the submarine. If the health status falls, you will have to start all over again. Don't worry about the game, because when you are not actually playing Battleship, a computer randomly moves for you. Just focus on keeping health up and when the health bar is more than half full, use the periscope to make hits. 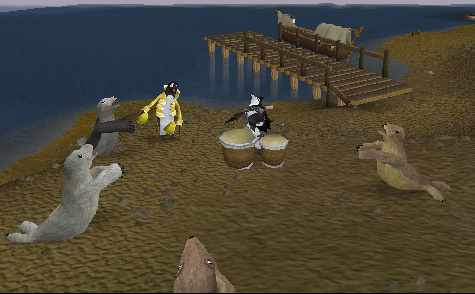 After you've destroyed the enemy ships you will get a victory message and arrive at Ardougne Zoo. After a short dialogue, quest complete! 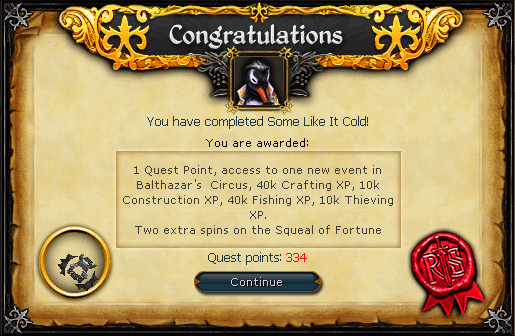 After completing this quest, you will be able to hunt an 11th penguin in Penguin Hide and Seek. The maximum amount of penguin points you can earn per week is now 19.